This is the fifth part in a series of blog posts. The previous post was Amiga/Gotek boot test. 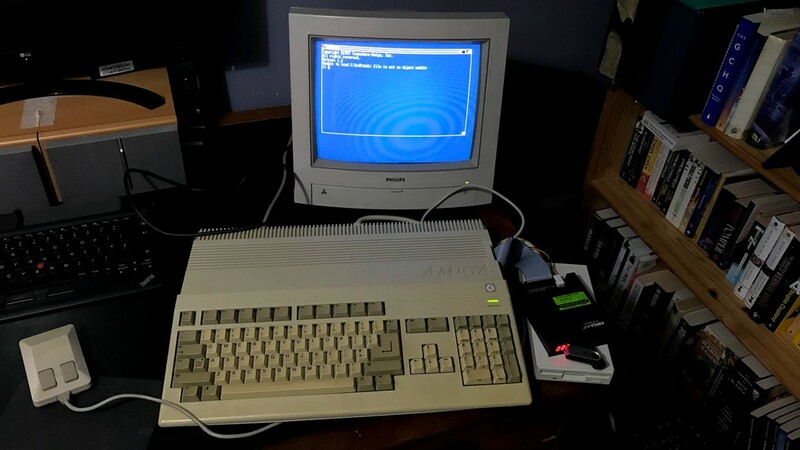 The next post is Learning new things about my old Amiga A500. 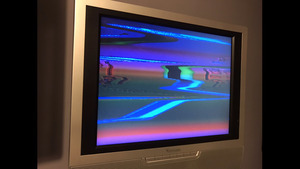 As I was planning out my next Gotek-floppy-adaptor experiment, disaster struck: the video out from my Amiga had become terribly distorted, in a delightfully Rob Sheridan fashion, sufficiently so that it was impossible to operate the machine. Reading around, the most likely explanation seemed to be a blown capacitor. These devices are nearly 30 years old, and blown capacitors are a common problem. If it were in the Amiga, then the advice is to replace all the capacitors on the mainboard. This is something that can be done by an amateur enthusiast with some soldering skills. I'm too much of a beginner with soldering to attempt something like this. I was recommended a company in Aberystwyth called Mutant Caterpillar who do a full recap and repair service for £60 which seems very reasonable. Luckily, the blown capacitor (if that's what it was) wasn't in the Amiga, but in the A520 video adaptor. I dug my old Philips CRT monitor out of the loft and connected it directly to the Amiga and the picture was perfect. I had been hoping to avoid fetching it down, as I don't have enough space on my desk to leave it in situ, and instead must lug it over whenever I've found a spare minute to play with the Amiga. But it's probably not worth repairing the A520 (or sourcing a replacement) and the upshot is the picture via the RGB out is much clearer.